Buy Stella Artois Belgian Lager & Other European Beers Online! 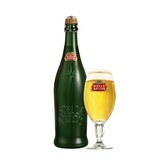 Stella Artois is part of a rich Belgian brewing heritage dating back as early as 1366. Stella Artois is still brewed using the finest natural ingredients in the tradition of hand-crafted luxury. Today, Stella Artois is the No. 1 Belgian beer in the world and served in 95 counties. Pairs well with cured meats, hard cheeses, and seafood. Stella has a pleasantly bitter hoppiness and refreshing, crisp finish with a distinct golden color.